This is going to give away my age. Once I was given a very, very nice record player. It was a thing of great beauty with sleek lines, beautifully crafted bolts holding the components in place and the exquisite working exposed. In concert with a great amplifier and speakers it could burst your eardrums while the sound stayed crystal clear. It drew all sorts of compliments from people who saw it and it was possibly the nicest thing I have ever owned, until recently. 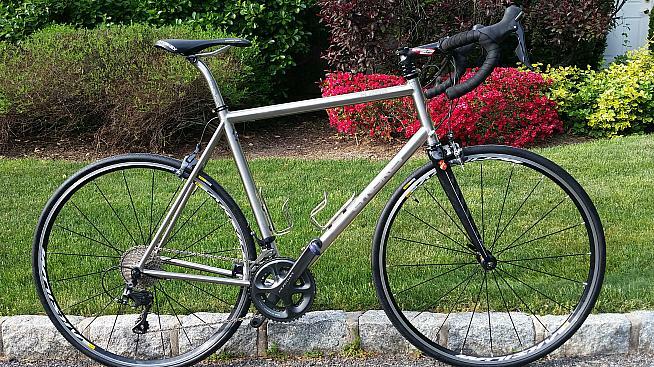 Lynskey R255 with Shimano Ultegra 6800. Don't be fooled on the geometry while it is relaxed my short legs require a lower seat height than is normal. This is the item that has replaced it in my affections. 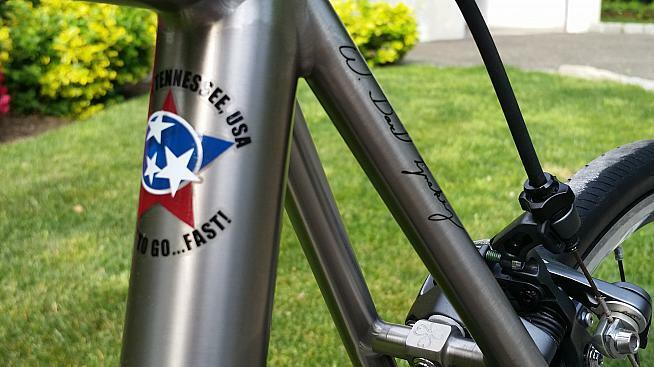 It is a Lynskey R255 with a brushed finish and etched logos. 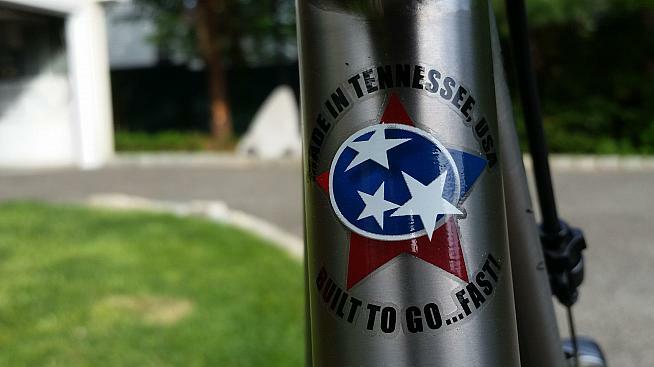 Titanium, of course, and made in Chattanooga, Tennessee. It arrived in late November and since then I have ridden around 1,750 miles on it despite the weather in NY State limited me to only eight rides outside in the first three months of 2015. 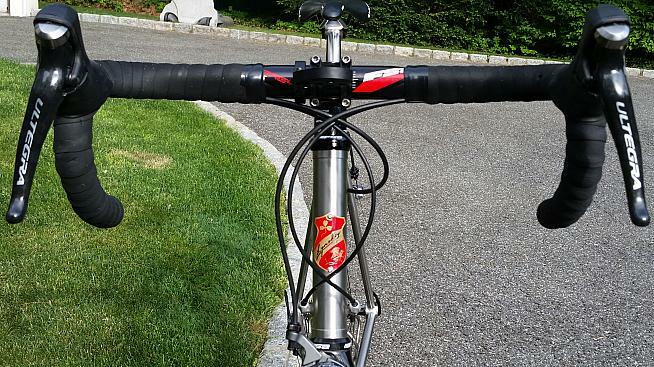 Lynskey wants its bikes ridden properly. Those miles have included many solo training hours, regular thrashes on the Gimbels group ride, a few centuries, including Gran Fondo New York and the Highlands Gran Fondo, forays onto gravel early in the season at the Hell of Hunterdon and the Battenkill Gran Fondo, and even, just recently, the White Plains Criterium on a city-center, four-corner half-mile course. The R255 has coped with all of them fantastically. With frame geometry modeled on the Bianchi Infinito, it is designed to be - and succeeds in being - a long-distance, all-day machine. That it is also rock-solid, precise and confidence-giving in a downhill crit corner with bodies all around is testimony to the underlying quality of the bike. Titanium has a reputation for giving a comfortable ride, for smoothing out the bumps and allowing you to ride all day without the need for a chiropractor and that is what I have found with the R255. It is as smooth as silk and I occasionally wonder if there is a drop of mercury in the frame with the way it flows down the road. The R255 is a considerable upgrade from my previous bike, a Specialized Secteur Sport with Sora. I won't knock the Secteur as it was a great bike for me on my return to cycling after an absence of 20 years, but the comparison with the Lynskey sporting Ultegra 6800 is just unfair - as it should be given the price differential. At $4,150 after a significant sale discount, this was a very significant purchase and to justify it I needed to tick off all my requirements. The R255 does that in spades even before you add in the intangible benefit of the joy it brings me. My interest in titanium bikes was sparked by ads for Enigma Bicycle Works, a company creating beautiful machines in Sussex, England. I thought they looked gorgeous and I wanted something that could last forever if looked after. A request for a review test ride for Sportive.com, Granfondo.com's UK sister site, went unanswered or there might well be an Enigma Etape in the garage. Once the Titanium bug had bitten then a little research threw up beautiful machines from the likes of Moots, Litespeed, Seven and many others, including ..... Lynskey. The etching was a $250 upgrade. I then wrestled with the choice between the R255 and the racier R230 (Don Erwin explains all in this video, which is one of a great series that tries to answer every possible question on features and comparisons). I went with the more relaxed geometry of the 255 and was also swayed by the round tubing throughout. The 230 has an "oversized and bi-axially ovalized performance driven tubeset" and - shallow as I am - I prefer a more traditional look. 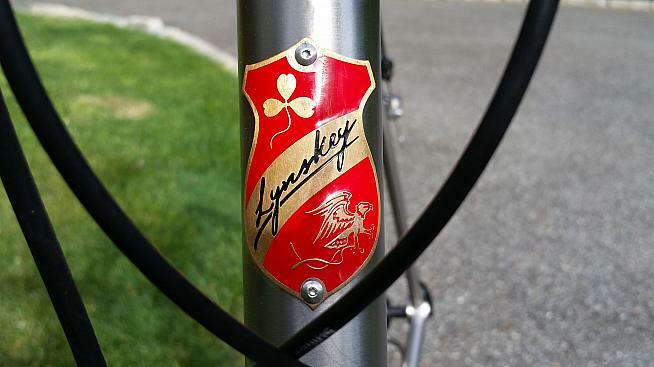 I bought direct from Lynskey's website and the client service during the process was superb. Details include the clover on the brake bridge. The bike has attracted comments on the Gimbels ride where it is in good company with a number of other regulars on Lynskeys or old-school Litespeeds among the herd of carbon machines. A couple of jokes have been made about the 50x34 compact and 11-32 cassette, but when I am suffering on the climbs of the Maratona dles Dolomites and the Etape du Tour I am damn sure I will be pleased to be able to spin away in 34x32! The only disappointment in the whole process came after I had the bike. The third time I took it out I was suddenly unable to freewheel with the chain drooping towards the road whenever I didn't pedal. The LBS diagnosed a damaged freehub and replaced it. I contacted Lynskey to see how they wanted to handle what was clearly a defective part on a brand new bike. They told me to contact Mavic and said, very politely: "not our problem". Given I had just parted with over $4,000 for my bike, I was stunned. Unsurprisingly given that there are forums on the impossibility of getting a response from Mavic, I had no joy in reaching them. It was not the largest amount of money and maybe I am being naïve in thinking Lynskey, which as a wholesale cutomer of Mavic's has to have more clout than a random individual, would take a different approach. It still leaves a slightly sour taste. It does not, however, affect my feelings for the R255. Black and silver throughout bar the badge. I love it. I love the way it rides, I love the way it looks and I love the way it makes me feel while I am out on a ride. I find myself patting it as I place it in its stand in the garage after a ride and throw it admiring glances when I take out the recycling. I just need to get good enough to make the most of its potential. Sadly, the turntable was stolen - a fate I will do everything in my power to prevent happening to the R255. 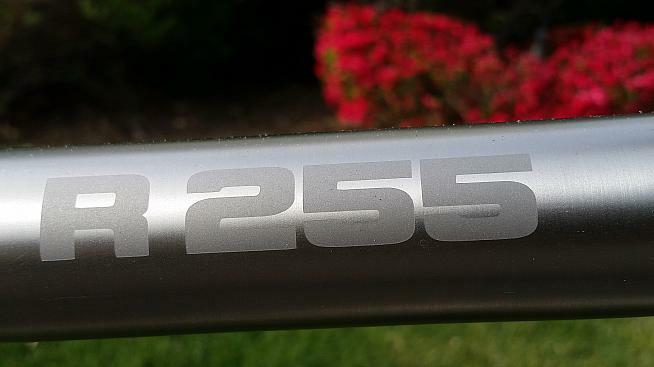 Lynskey R255 Large frame with a brushed finish and etched decals. Orbit Equipe Black headset and Gossamer Compact Handlebar from FSA. Shimano Ultegra 6800 11-speed groupset -- Compact 34x50x175. Mavic Aksium clinchers with 25mm tires. 19lbs as shown in the photos.